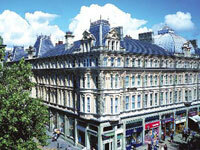 The Parc Hotel Thistle is a recently renovated Victorian hotel located right in the heart of Cardiff city centre. It contains 140 guest rooms that have been completely refurbished with contemporary furnishings and gleaming modern bathrooms. All guest rooms are equipped with the very latest technology including WiFi internet access. Guests can dine in the award-winning Hamon's restaurant and then choose to relax in either the lounge bar or the champagne bar. The Parc Thistle is well placed to host private functions or meetings with its large conference and banqueting facilities that can accommodate up to 300 delegates or cater for up to 250 guests. Recently renovated historic city centre Victorian building. Newly refurbished guest rooms offering the highest-specification fittings. Dine at the award-winning Hamon's restaurant. WiFi Internet access available throughout the hotel.